To paraphrase Mark Twain, the rumors of Pandora‘s (s P) death have been greatly exaggerated. The Oakland-based music discovery service might have lost its mojo on the stock market, but it is still managing to grow and win on one (and probably the most important) metric: total listener hours. When more people listen to Pandora, the more opportunities the site has to embed ads and make money. Here are Pandora’s July 2012 audience metrics. Total listener hours for the month of July 2012 were 1.12 billion, up from 1.08 billion in June 2012. In July 2011, Pandora clocked 637 million listener hours. 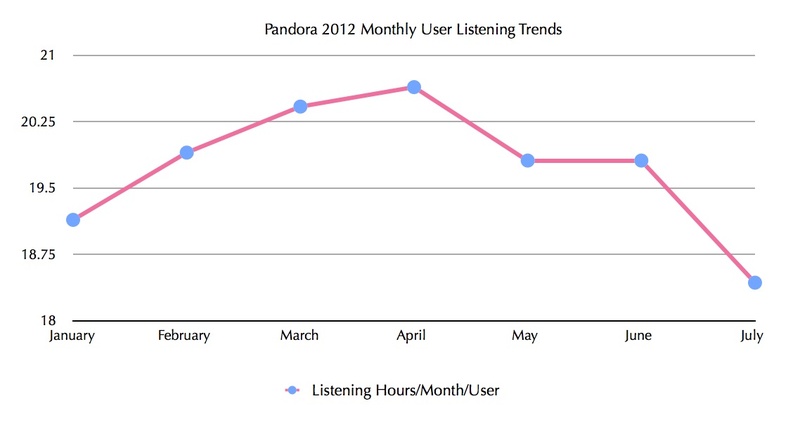 During the second quarter of 2012, Pandora’s total listener hours were about 3.30 billion. Pandora had 54.9 million active users at the end of July 2012, up from 54.5 million in June 2012. The company has more than 150 million registered users. Goldman Sachs estimates that Pandora’s share of total radio listening grew to 6.13%, up from 5.98% in June 2012 and 3.51% in July 2011. The real measure of Pandora’s (or, in fact, any similar product’s) engagement is total minutes (or hours) spent listening to the site per month per active user. That would be a clearer sign of how it stacks up against competition, though none of its rivals share this number. On this crucial metric, Pandora seems to be trending down. Pandora’s growth comes despite perceived competition from the likes of Songza and Spotify, two of the recent entrants into the music discovery business, especially on mobile. At the end of March 2012, 70 percent of Pandora usage was on the web and rest on various mobile platforms. Pandora’s main competition is not new mobile upstarts but terrestrial radio, a $17 billion market. As more and more of our attention moves online, companies like Pandora, Spotify and Songza are going to eat into the traditional radio business. It is just a matter of time before the attention transformation shifts entirely to the Internet. However, in order for the company to grab a bigger share of the ad dollars, it needs to come up with new advertising formats, ones that befit its business. The current banner-based advertising model is short term at best. It is one that threatens company’s business especially on the mobile platforms. Over the years (well at least since it launched on the iPhone), Pandora’s mobile experience has degraded quite a bit. The mobile ads on the iPhone app are garish and seem tasteless. But I guess, they bring in the dollars! Despite growing numbers, I do think that Pandora is a good short. The user experience is inferior (e.g. compared to 8tracks), the company’s monetization model is flawed (i.e. seeking display dollars when users are moving mobile or automotive), and the overall value proposition just got clobbered by Spotify (per Stephen’s point, get Spotify for $100/yr and enjoy unlimited on-demand, without ads, and anywhere). Add the hefty royalties and the lack of social to the mix, and the picture is complete. I think Pandora benefits greatly from their “first in” brand identity. But that huge lead will whittle away once their competitors find unique and compelling ways to tweak their own product. The chart on “Listening Hours/Month/User” shows this is already happening. Every single service lets you play essentially the same core group of songs. (All companies admit no one ever dives deeply into the full catalog of songs available on any service.) What’s still missing from EVERY service is curated content. The first provider to consistently deliver customized content that appeals to heavy users of their service will have a leg up in creating powerful customer loyalty. There is clearly an issue for the company and they need to make their experience better. But unless they completely fumble the ball, the situation isn’t as dire as it seems. I do agree the listener hours/user/month/ trend isn’t healthy and if this goes on for another couple of months, then it is time to sound the alarms – rightfully so. Didn’t mean to suggest their situation is dire Om, but any sector leader who gets lazy on quality and innovation puts their position at risk. I guess depth is in the mind of the digger. Some years back I put “Imaginational Anthem” into Pandora’s search. It responded by indicating it didn’t have the track, but did begin a “station” that had very similar sounding music. One week later when I logged on, it had the track. “Imaginational Anthem” is an EXTREMELY obscure piece of music by Max Ochs from 1969. Pandora not only knew about it, they had it. BTW, were you ever at a BAMD radio station? I was a big Pandora fan last year, and I told myself I’d make an investment at a 1.5 billion market cap, which it’s close to now, and has bounced off of several times, but since I’ve become a Spotify Subscriber, or actually since Spotify launched their “Radio” feature, I don’t see any need to go back to Pandora. That’s what keeps me from making an investment, myself. I don’t use it. But I do believe it will grow with the whole digital revolution, as you mention. It definitely had a head start on mobile and has brand recognition. Once crucial feature of Spotify and Rdio, which seems so vane and egotistical, yet very potent, is the sharing what you listen to to Facebook. I mean even if I own an album, I usually will prefer to listen to it on Spotify, to show everyone what I’m listening to, especially if the record or artist is considered “hip.” I guess Pandora has this feature, but I never see it in my feed. I constantly see Rdio and Spotify in my feed though, which obviously is also free and invaluable advertising for them too. I don’t know why Pandora doesn’t copy all of Spotify’s features (assuming they can) just as Spotify has copied one of the crucial features of Pandora: Discovery. You can do this with Pandora. Personally i find the sharing of songs you are playing constantly distasteful and intrusive experience. I do like sharing of playlists and subscribe to many on Spotify. The only problem is that I hate listening to Spotify on a desktop because their app is a resource hog. I love Spotify on my Sonos, though experience there is less than stellar. Pandora, for me is for times when I don’t want to think and just let the system surprise me. I find the Spotify Radio a bit meh. I am guessing a lot of it has to do with personal choices.